The Pacers entered the 2013 Playoffs as the Eastern Conference’s third seed and surprised everyone by advancing to the Conference Finals, where they gave the eventual champion Miami Heat all they could handle. A close series went the distance to seven games. Since that 33-7 start, no NBA team has followed a more curious trajectory. In the second half of that same season, the Pacers went a mediocre 23-19 even with a healthy dose of bad Eastern Conference competition. The absence of an immediately obvious explanation for that drop was even more baffling. Roy Hibbert went from being a Defensive Player of the Year candidate to, at times, a defensive liability in the same season. Paul George was bound to regress from his outstanding and high-volume midrange shooting numbers, but he took an unforeseeable drop from an MVP candidate to merely a very good wing. Lance Stephenson … well, okay, maybe we should have known better than to expect consistency from Lance. That season ultimately ended with Indiana bowing out meekly in the Conference Finals against Miami. Then, that offseason, LOOK AWAY! Paul George’s gruesome broken leg put the Pacers’ star on the shelf for all but six games of 2014-15’s season. Without George, the Pacers were exposed, finishing the season 36-44 – not good enough to qualify for the playoffs even in the weak Eastern Conference. No one knew what to expect from Indiana before this season. Three members of Indiana’s starting lineup during their last Conference Finals appearance had departed. When the Charlotte Hornets offered Lance Stephenson a huge deal in restricted free agency in the Summer of 2014, team President Larry Bird didn’t rise to the bait and let him leave; a move that looks like a stroke of genius in retrospect. Tired of Roy Hibbert’s unpredictable and maddeningly inconsistent play, Bird was content to send him off to rebound Kobe’s bricks in Los Angeles this Summer. In a more amicable divorce, David West opted out of his contract this offseason to go chase rings in San Antonio. Uncertainty surrounded this team in the leadup to this season’s tipoff. Not only was George coming back from a horrifying injury, he was coming back to a new and unfamiliar role. Head Coach Frank Vogel announced over the Summer that George would no longer be playing exclusively as a wing and would be featured primarily as a stretch 4: one of the new small-ball power forwards that are becoming a mainstay around the League. The big, bruising Indiana team that had found success by beating teams in a very literal sense would be replaced by players with a more delicate and skilled approach. 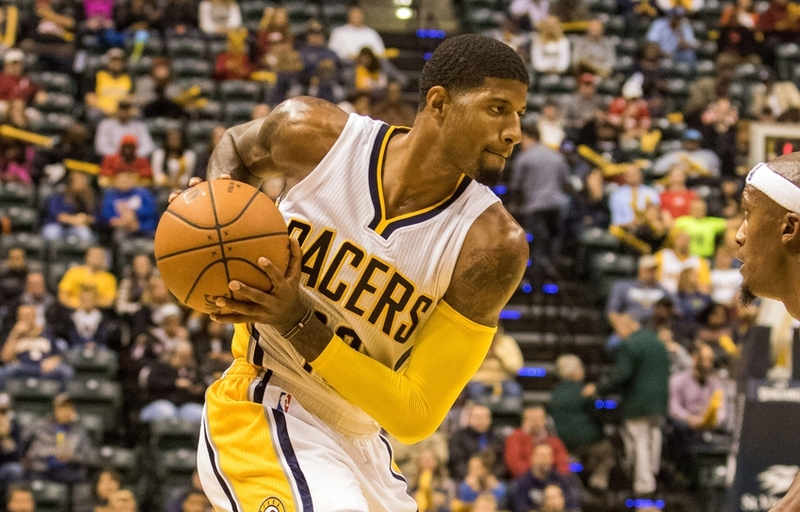 Hibbert out, Jordan Hill in; David West out, slot Paul George over and put C.J. Miles in; Lance Stephenson out, Monta Ellis in. The success of this season hinged largely on unknown contributors stepping up in roles of varying familiarity and, more importantly, a strong injury return from Paul George. George’s comeback has been the best story of the early season, to the delight of Indiana fans. Not only is he adapting to his new stretch 4 role, he is excelling in it. After an injury so horrible, fans couldn’t be blamed for merely hoping George could get back to who he was before. Instead, George is playing better than he ever has. George’s resurgence has been the biggest reason for Indiana’s 12-6 start, but it’s not the only reason, and now comes the bad news for the Pacers – there are a number of factors in their hot start which indicate an upcoming regression. The Pacers’ new small ball approach has been incredibly effective, vaulting their offense from 24th in the NBA one season ago to 8th this year. Paul George’s presence certainly plays a large part in that, but not as much as the entire team’s shooting numbers. 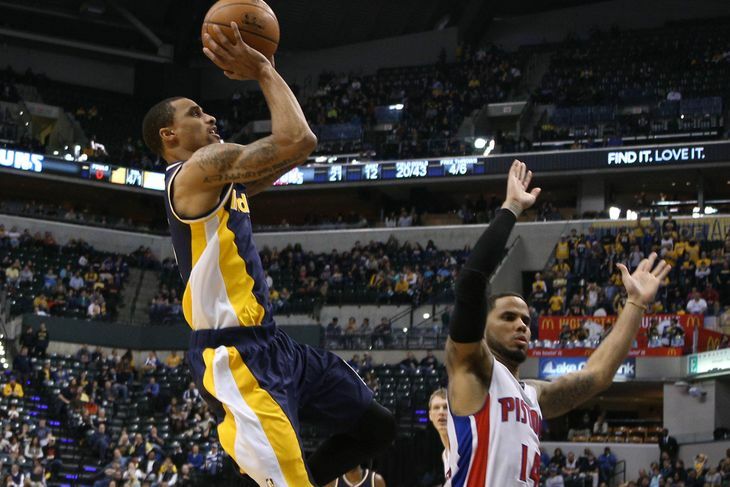 Simply put, the entire Indiana Pacers team has been raining death from three-point range. That shooting and scoring outburst has been the result of Indiana players making their shots at an unsustainable rate almost across the board with Monta Ellis, who has never been a great shooter to begin with, serving as the lone exception. That is a statistical aberration that will sort itself out over the course of the season. When it does, Indiana’s offense will undoubtedly fall off. On defense, this made-over squad is still proving a very tough bunch despite being outsized in most situations. They rank 6th in defensive efficiency and have excelled in defending on the perimeter and from midrange. The downgrade from West and Hibbert to George and Mahinmi at the 4 and 5 has led to opponents having more success down low near the rim, but that has been compensated for by this team’s improvement in defending shots on the perimeter and from midrange. The Pacers are not the dominant defensive force they once were. In 2012-13 and 2013-14, they ranked 1st in the NBA in defensive efficiency. But, the athleticism and length that still remains has created a very good defensive unit. Their slight defensive drop-off is a bit discouraging as far as the ceiling on this season goes, but their offensive improvements – even after the pending shooting regressions – will likely prove sufficient to power Indiana to home court advantage in the first round of the Eastern Conference Playoffs. The Pacers are not the .667 winning percentage team they have looked like through their first 18 games. Even so, their surprising play has been one of the great joys for the neutral fan so far this season. After entering the season with so much uncertainty, it’s good to see Paul George and the Pacers catching the right breaks for once … too soon? **All statistics in this article were gathered from NBA.com/stats, except where otherwise noted.